Theme extends standard functions for WordPress menu and makes it more flexible and powerful. In order to create menu you need to go Appearance->Menus and click create a new menu. After that add new items to the menu as you usually do it with wordpress and click "Save". You will see new fields editing menu item like Design, Icon name, label text and color, dropdown color scheme, one page anchor, "call to action" button, mouse event and image. 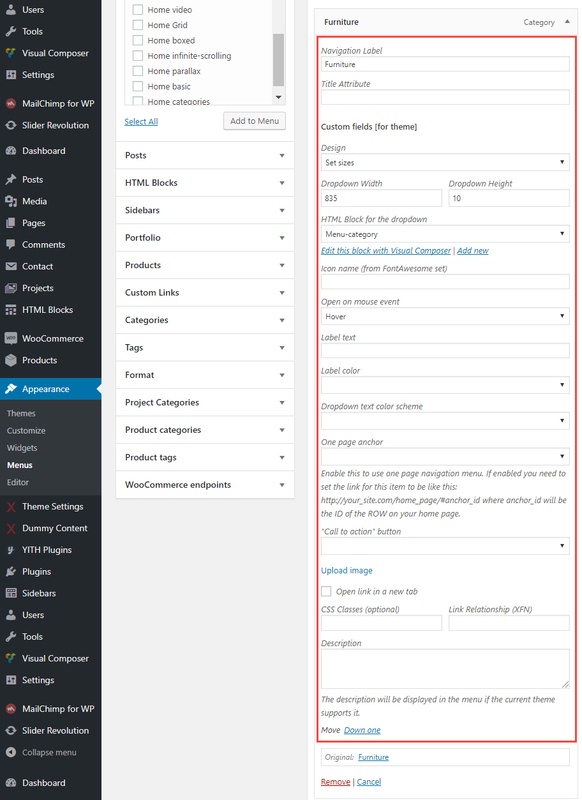 To create “Mega menu” dropdown you need to create a new HTML block in admin panel with WPBakery Page Builder (to enable VC for this post type you need to go to WPBakery Page Builder -> Role Manager -> Post Types and choose custom then select all post types). You can set it’s layout as you wish using rows, columns or any other elements. After that, you just copy this block’s shortcode, go to Appearance -> Menus and paste it to the desired menu item’s description field. If you don’t see “Description” field you need to check it to be shown in the “Screen options” in the right top corner on this page. Also, change its design to “Set sizes” and set dropdown sizes.